Clerics call for "a referendum in which all the people of Iran can participate"
TEHRAN, Iran (CNN) -- A group of top Iranian reformists have called for a national vote on the country's disputed presidential election in order to "exit this dead end and current crisis." Former president Mohammad Khatami backed reformist candidate Mir Hossein Moussavi in the June 12 vote. The Association of Combatant Clergy issued a blistering statement saying the people's trust had been lost after the opposition was "met with brutality, beatings, indecency and incarcerations." Iran's current leaders "betrayed the revolution, its values, the homeland and the people, in irreparable ways," according to the statement, posted Sunday on Rouhanioon.com, the Association's Web site. The group is linked to Mohammad Khatami, the former president who supports defeated presidential candidate Mir Hossein Moussavi. Officials declared hardline President Mahmoud Ahmadinejad to be the winner of the June 12 election, prompting nationwide street demonstrations by supporters of Moussavi and other opponents of the incumbent leader. The reformist clerics called Sunday for "a referendum in which all the people of Iran can participate freely and express their opinions regarding what has happened. Of course not a referendum conducted by the same centers and structures that have reduced the elections to such fate, rather under the supervision of a neutral structure, trusted by the people." The country's constitution says that only the Supreme Leader Ayatollah Ali Khamenei can order a referendum and the election authority, the Guardian Council, oversees all voting. The Guardian Council has already thrown out objections to the results of the election. The reformists also strongly supported former President Ali Akbar Hashemi Rafsanjani in their statement, two days after he called for the release of people detained in the post-election demonstrations. Rafsanjani still holds a high-ranking post in the clerical leadership but has become increasingly vocal in opposing the brutal crackdown on demonstrators, which continued after his Friday appearance at official weekly prayers. "We deeply appreciate the courageous and kind presence of Ayatollah Rafsanjani and thank him for his words," the reformists said, calling him "one of the first soldiers at the forefront of the Islamic Revolution." But another senior cleric hit back at Rafsanjani on Sunday. Grand Ayatollah Jaafar Shojuni said Rafsanjani's "unsubstantiated allegations" about the election could not only raise doubts "to the detriment of the system, but will also render its institutions meaningless." "If this happens and we start to disband the authoritative posts of the system, then there will be no rock left unturned," Shojuni told the official Islamic Republic News Agency. He added, "We cannot reconsider those who were unsuccessful in the elections." The reformists portrayed themselves as the defenders of Iran's 1979 Islamic revolution in their statement, which seems designed to increase pressure on the government. "Safeguarding the Islamic republic, which is the great result of the Islamic Revolution; is a duty of us all," the statement said. It criticized those who "claim to be revolutionaries and followers of Islam," an apparent reference to the authorities, and warned that " if the current situation continues, all will be losers." 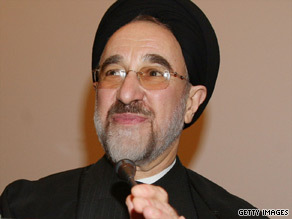 The Association of Combatant Clerics includes most of Iran's leading reformers, including Khatami, who was president from 1997 to 2005, Moussavi, and Mehdi Karrubi, another candidate who was defeated last month. Karrubi blasted what he called the "thoughtless and clear lies" of the country's security forces on Sunday, while students mounted new demonstrations at a university in Shiraz. "How do they try to say that they do not confront people violently or to blame others? All of this took place in front of people's eyes," Karrubi told supporters, according to Iran's Aftab news agency. "They kill the youth in front of people's eyes and then say that they didn't have firearms. As a member of this system, I am embarrassed of these thoughtless and clear lies." There were reports Friday that Karrubi himself was roughed up by members of the Basij, the paramilitary force loyal to Iran's hardline leadership. CNN could not independently verify those reports at the time, but Karrubi said he was "assaulted" and his turban knocked off, according to Aftab. Several videos posted on social media sites showed what was billed as a protest by students at Ehsan University in Shiraz on Sunday. Scores of students are visible in the clips, which featured students demanding the release of political prisoners and singing songs from the 1979 revolution.